Let me clarify. I’ve known about podcasts for years but I never listened to them. Why would I? And when? I’m too busy at work, and in the evening I usually watch video. But I discovered a great time to listen to them – when I’m walking to work. For you see, it takes me between 25 and 30 minutes to walk to work each day which means I have around 50-60 minutes of just walking. It turns out that is the perfect time to listen to a podcast. What I did was subscribe and download a bunch of them to my phone. I plug in a pair of headphones and on the way in, I listen to an episode and on the way home I listen to the rest of the episode. It really passes the time. I also used it when I went hiking this past weekend. It also helps to break up the fatigue of moving uphill. Man, why did I never think of this before? 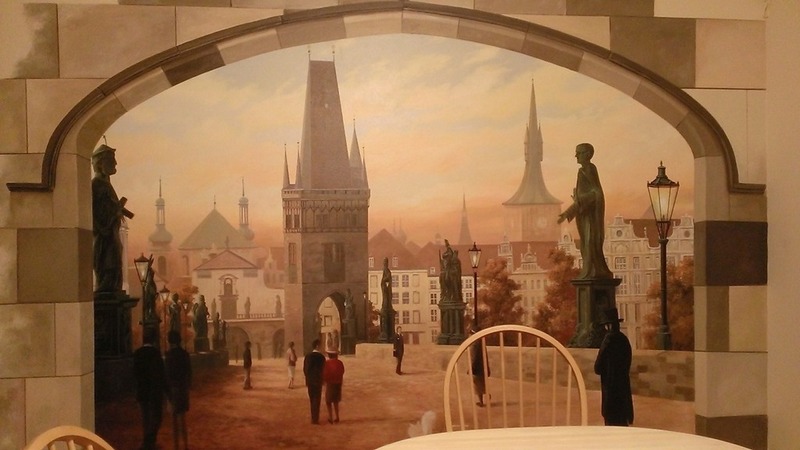 If you haven’t noticed the various posts on my Facebook feed, we now have a mural on our wall next to the dining room. It’s a picture of the Charles St Bridge in Prague in the Czech Republic. I really liked the city of Prague – I was intrigued by its multiple types of architecture: Renaissance, Gothic, and Baroque. In the picture above, you can clearly make out Gothic and Baroque. What’s the difference? Well, Baroque devices from the French term “tromp l’oeil” which means to “trick the eye.” That style is not reflected above although it is everywhere in Prague. Instead, another part of Baroque style are the ice-cream cone-style roofs on some of the ceilings. If you look in the distance you’ll see them. Gothic, by contrast, is characterized by its long spires and ash-colored roofs. That’s the central focus of the bridge and even the clock tower on the right. I like that style of building. But I also liked the bridge especially for its religious significance. The Charles St bridge has carvings of Christian saints all along the side of it, and Gothic churches have a history behind them in that their layout is intended to tell the gospel story; it was how it was told to pre-literate societies. For example, the churches are laid out in the shape of a cross, they are oriented a particular direction, and the spires signify being close to God. The Czech Republic has one of the highest rates of atheism in Europe but it was not always this way, as demonstrated by its architecture and carvings. I’ve wanted a mural on the wall for a couple of years now. I had several ideas in mind but ultimately settled on Prague after I bought a painting on the street but couldn’t find a frame that fit for it. Rather than spending $100 on a frame (no exaggeration), I decided to spend money on the wall. The wife is currently out of town in Colorado meaning that if I want to go on a hike, I either go alone or I find a friend. Both friends I would normally go with couldn’t make it, so I went alone. I can’t go with new people because they move too slowly for me. I used to be a slow hiker but I can keep up a reasonably good pace. 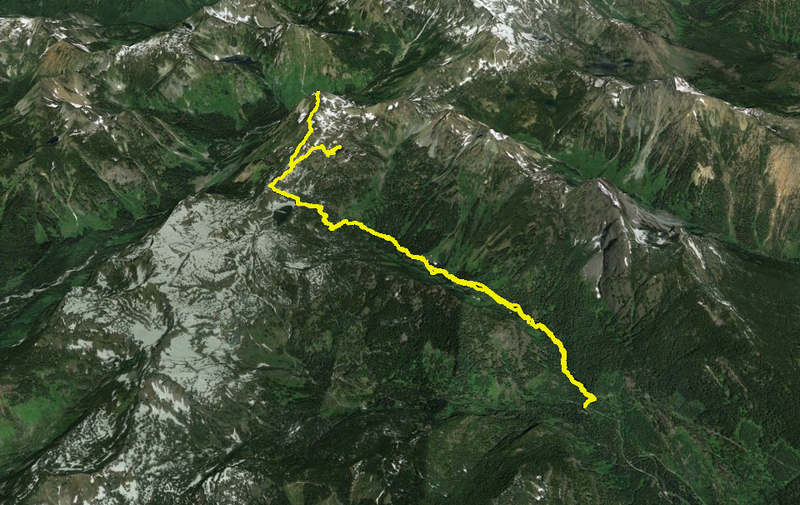 Anyhow, last weekend I did Alta Mountain which is about 20 miles off of Interstate-90 around 60 miles from Seattle. Alta Mountain is a long hike and gains 3500 feet. The first 3 miles I walked, I thought I got to the wrong place because the signs were not obvious what I was hiking. The hike was also more-or-less flat which is a boring hike. I wanted something difficult! Flattish hikes are not challenging. Anyhow, at the 3 mile mark the hike started getting more difficult. I realized I was probably at Alta Mountain after all. But more than once I went the wrong way, including going to a lake. And I nearly got lost several times on this hike due to the trail being so poorly marked. And I had a GPS! After I got to the lake, I realized I had gone the wrong way. But I had already walked a long distance on a hot day and I was getting tired. I trudged back 20 minutes to the junction where I found the direction I should have gone. 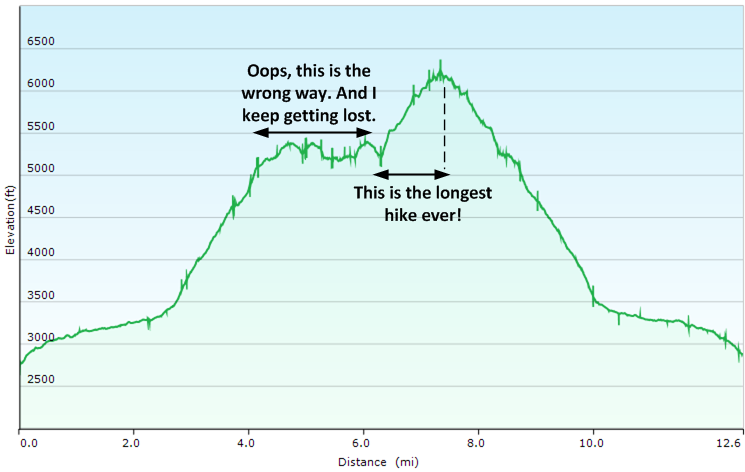 At this point I had already walked 7.5 miles; did I want to walk another difficult part? I took five minutes to decide and did it. I continued upwards. I hate going up after I’ve already mentally committed that’s all downhill. And it was a tough slog. Multiple times I almost gave up. But I didn’t. I kept going. I almost turned around 3 times, but in the end I made it to the top. I only stayed five minutes. I wanted to come down. But, I made it. So that’s what I did last Saturday. Last week, I had my first dental appointment follow up. I was in and out in 30 minutes. It hurt, though. Probably worse than getting them put on. Since I’ve had my braces put on, my teeth haven’t stopped aching. For the first three days, every tooth hurt when I bit down on food. Then the back ones felt better, then some more on the side, and finally the front ones. But, my teeth have always hurt at some point. My front tooth will ache for a few days and then get better, but then another one will hurt. This rotation happens again and again. There’s always one that is in pain when I bite, and usually a front one. They take turns. I have been taking picture of my teeth every couple of days, and I have noticed that one of my front teeth has straightened (or moved) into position. So, I guess that these braces have done something so far. I only have 688 more days to go until I get them off. That means I am 5.7% finished. Hooray!